On An Overgrown Path: Will Pablo Casals be trending this autumn? Will Pablo Casals be trending this autumn? October 22, 2013 is the fortieth anniversary of Pablo Casals' death, and it is interesting to speculate on how, if at all, the anniversary will be marked. Despite some noteworthy compositions Casals is remembered as a cellist not a composer, and his legendary cello recordings predate high fidelity and most are out of copyright. So there are no easy pickings from CD or publishing royalties, which means his anniversary is difficult for the classical music industry to - forgive the jargon - monetise. Then, of course, 2013 has a surfeit of music anniversaries, and the very bankable Benjamin Britten centenary falls less than four weeks after the Casals anniversary. Although Britten and Casals died within three years of each other and both made important contributions to the art of the cello, their paths apparently never crossed. There is not a single mention of Britten in Pablo Casals' autobiographical Joys and Sorrows or Robert Baldock's biography of the cellist, and Humphrey Carpenter's definitive biography of Britten reciprocates with no mention of Casals. Today Britten is hailed as an innovator while Casals is too often dismissed as a reactionary, which is both unfair and wrong. Casals once declared that "All great artists are innovators", and in the 1920s he programmed much contemporary music with his own Orquestra Pau Casals in Barcelona. In addition to Catalan composers such as Juli Garreta, Enrique Granados, Isaac Albéniz, Lluís Millet, Gaspar Cassadó, Enric Morera and Roberto Gerhard the concerts included works by Bartók, Richard Strauss, Mahler, Milhaud, Kodály, Prokofiev, Webern, Honegger, Schoenberg and Stravinsky. Although Casals was not a fan of twelve-tone music, Schoenberg was invited to conduct a programme of his own compositions with the Orquestra Pau Casals. Schoenberg went on to create a Cello Concerto from music by the eighteenth-century composer G.M. Monn for Casals, although the cellist did not perform it due to a copyright dispute. Casals was also a vocal champion of Ernest Bloch, a twentieth-century master composer who still has not received the recognition he deserves. Casals shared Britten's commitment to non-violence, saying 'I think that if all the mothers of the world would tell their sons, "You were not born to kill or to be killed, so do not fight," there would be no war', and his tireless work for Spanish Republican has been chronicled here. Britten's creative response to violence was his masterpiece the War Requiem which was given its first performance in 1962, while two years earlier Casals had conducted the first performance of his peace oratorio El Pessebre. Although the two works could not be more different they share the common aim of deploying, to quote Casals, "the only weapon I have at my command - my music". Whereas the War Requiem demands the highest calibre performers, El Pessebre was written to be performed by competent rather than expert forces, and Casals conducted it around the world as part of his global peace crusade. But classical music is now a fashion industry, which means that, despite its engaging naivety, El Pessebre is forgotten today and not a single biography of its celebrated composer remains in print. So Pablo Casals is a rank outsider in the classical music anniversary stakes, and despite being world famous for arranging and playing the Catalan folk melody Song of the Birds, it is unlikely that he will be trending on Twitter this autumn. But regular readers will know that I am a self-confessed Casals groupie, and that I also prefer to bet on rank outsiders. So look out for more about Pablo Casals On An Overgrown Path. * Note on naming convention: In Spanish Casals' forename is Pablo, in Catalan it is Pau. 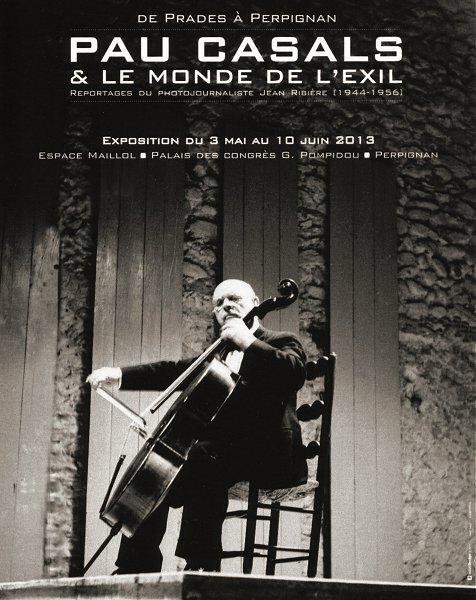 Traditionally he was known as Pablo, but the recent rehabilitation of the Catalan language means Pau is now frequently used, as in the Perpignan exhibition poster. For the sake of consistency I have used Pablo, for which I apologise to my Catalan readers. I guess that "Pau" is the forename Casals was brought up with and that "Pablo" is the Castilian Spanish version. Bob,I think of Pau Casals as being a giant of the century,not just musically. that Casals is thought of as a reactionary,[musically I reckon] and none of his bio's are in print,is so damned sad as to leave me stunned and speechless. TWD, yes, the neglect of Pau Casals is sad but true. When I was preparing this post I put the search term "Casals anniversary 2013" and variations thereof into Google to see if there were any noteworthy events to report. As of today the first hit for that search is my post from last year pointing out that Casals has an anniversary in 2013! In an interview a few years ago, János Starker said "My first hero was Casals... I cannot speak of Casals in terms of how contemporary cello playing is supposed to be, because he was our founding father, he put... contemporary cello playing on the map... he was a giant of an artist and musician." "[If Feuermann would have lived longer, he would have superseded Casals...] as a cellist, but not as an artist and not in the significance of what Casals represents in the world of music."